Why Grotto Santa Maria (Santa Maria Cave) is special ? Grotto Santa Maria or Santa Maria Cave, situated 20 minutes away from Trikora Beach, Bintan Island was built in 18th century by a Dutch Pastor. The 14 stations of the cross, tableaus and a statue of Mary standing on a globe are the main features of this site. 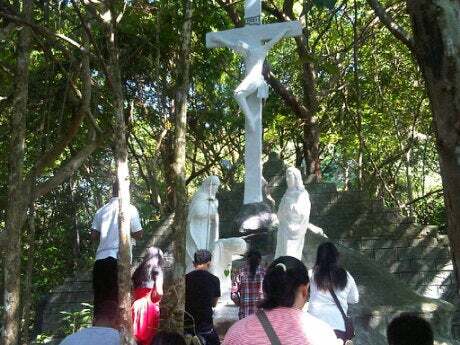 On every sundays, devotees will come to pack the place and sing songs of praises in the quaint little chapel on its grounds while enjoying a short get-together with everyone in the community. Until today the place is still very well preserved and maintained. You shouldn't give a miss when you do visit Bintan. What to explore at Grotto Santa Maria (Santa Maria Cave)? 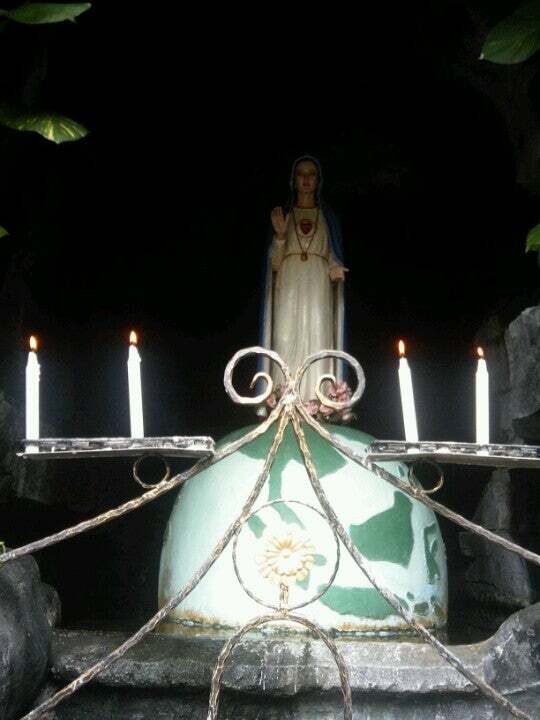 Grotto Santa Maria is a beautiful place of worship in Bintan Island. It has a rustic feel to it and well integrated with the greenery all around. The entrance leads to the trail of the "Stations of the Cross". The life size sculptures looked like marble but they are actually made of limestone. Most of the sculptures are very well kept, with little stains. At the end of the "Stations of the Cross", there lies the Grotto Santa Maria/ Santa Maria Cave. The cave is beautifully protected from behind by a large tree with overhangingbranches where colorful bougainvillea climb and bloom. How to get to Grotto Santa Maria (Santa Maria Cave)? The best way to visit the Santa Maria Cave is by taxi. You can also hire a private car from your hotel to visit the place. You may find a little bit difficult to open the door, but if you manage well, the interior will attract you by its quaint beauty. There's lots of mosquitoes inside the cave. You should bring along your insect repellent. There's also a small church inside and it's very crowded on Sunday, you shouldn't visit on that day. You should be careful when visit the place after the rain, the road lead to the cave is quite slip. 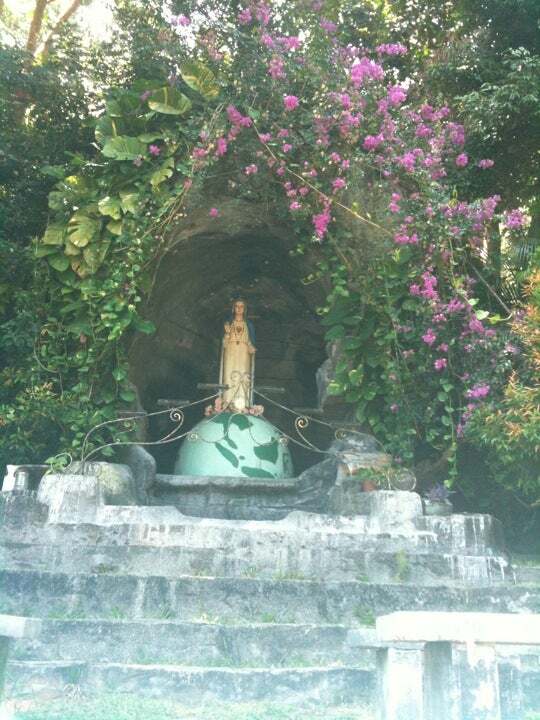 Along the stretch of Trikora beach over the street you will find the Grotto of the Virgin Mary. If you can't find the place via GGmaps, you should ask the driver to take you there. The church is very near Trikora Beach (about 20 minutes away from it), the most popular beach on the east coast famous for its white sand and clean water. Having been to Bintan a few times and staying at the resorts, we wanted to try something different. We went for a "Sea Gypsies" tour by BRC Tours and visited this during one of the stops. For me, I was surprised that Bintan has such a beautiful place of worship. Maybe cos we were always staying in the resorts area and thought that was all to see and do in Bintan. This place is really beautiful. It has a rustic feel to it, and I love how the place was well integrated with the greenery all around. The entrance leads to the trail of the "Stations of the Cross". The life size sculptures looked like marble but the guide explained that they are actually made of limestone. Most of the sculptures were very well kept, with little stains. Apparently this place was built around 1980s. At the end of the "Stations of the Cross", there lies the Grotto Santa Maria/ Santa Maria Cave. We saw some tiny fruit bats in the cave too! The Grotto was very unique and beautiful. There was also a little chapel near the Grotto. The doors were a little hard to open but we managed to go inside for a short while. It was nice and quaint. We prayed and left shortly after. While we enjoyed our visit here, we were victims to some mosquitoes. Do bring along your insect repellent!